Garapa is a high density hardwood species native to Brazil. The scientific name for Garapa is Apuleia leiocarpa. Garapa is also known as "Brazilian Ash" and "Grapia" as well as the trade names Garapa Gold and IronWood Garapa. 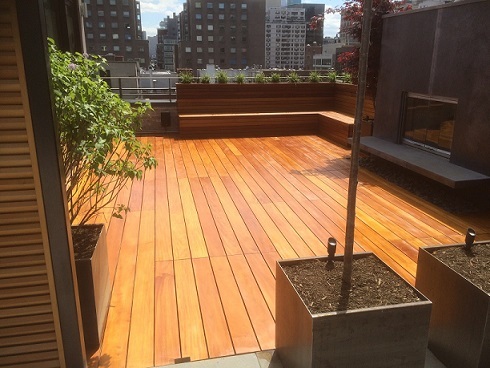 Garapa is a high density, very durable hardwood species that is ideal for use in exterior structures including decks, outdoor furniture, wood siding and more. Garapa's beautiful golden tones will enhance your project with a warm natural look. Garapa is among one of the most popular species of Brazilian wood. High density exotic hardwood decking materials such as Garapa decking, Cumaru decking, Machiche decking and Ipe decking are truly the best decking material options available.Garapa decking is beautiful, durable and offers a lighter colored decking material option for your deck. Garapa decking's low cost also makes it a very affordable choice as a decking material. What's so special about Mataverde® Garapa decking? 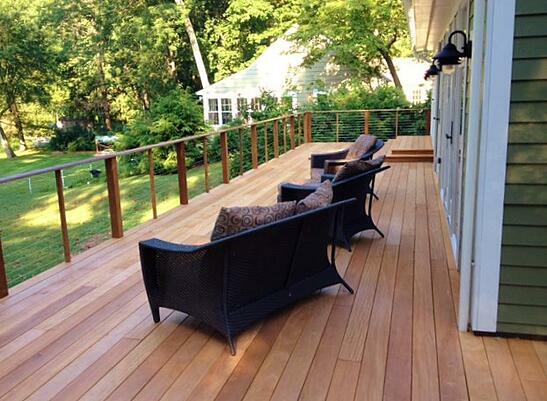 Mataverde® Premium Garapa Decking is a tough, dense wood with a soft looking satiny grain. With a lower density than Ipe or Cumaru, Garapa wood is still considerably stronger, harder and heavier than oak. Mataverde® Garapa Decking exhibits lots of character striping and color variation and will turn a soft silver color if left natural. Like Mataverde® Ipe and Cumaru, Garapa decking is extremely resistant to shrinking, splintering, cupping, twisting, checking and warping. From a durability standpoint, Garapa wood is extremely hard and comparatively dense and will resist most types of punishment. Mataverde® Garapa Decking has a high decay resistance rating throughout all fibers of the wood. Although not quite as high as Ipe or Cumaru, Garapa decking's high density and natural oils make it resistant to termite attacks as well. Mataverde® Premium Garapa Decking is all heartwood and ranges in color from a sun kissed honey blonde to a rich golden brown which will darken slightly with age. While the soft ribbon-like graining of Garapa decking is similar to maple or mahogany, Garapa decking has a beauty all its own. When left to weather naturally, Garapa hardwood turns a soft silvery platinum hue very similar to the appearance of weathered Ipe decking. Although Garapa wood shows less color and grain variations than most other high density exotic decking boards in a Garapa deck. Just like a wood floor inside a home, no two pieces of Garapa decking are ever exactly alike. The rich variations in Garapa wood reflect the character and beauty of this exotic natural species of tropical hardwood. What will Garapa hardwood look like as it ages? Garapa is well known for its beauty, strength, affordabiliy and durability. But at the end of the day, Garapa is still a natural wood, and all exterior wood will age differently when they are exposed to outdoor weather conditions. You have appearance and maintenance options to choose from. Learn more about the appearance options and life-cycle perfomance of Garapa hardwood. Garapa decking has a bending strength of 12,900 psi.That means that Garapa wood will span greater distances with very little deflection. The less deflection in a deck board means your Garapa decking is more solid and will "bounce" less when you walk on it. Garapa has a Janka hardness of 1,630 lbs (Garapa decking is much harder than White Oak). The only other wood decking materials that are stronger than Garapa decking are other high density hardwood decking materials such as Ipe and Cumaru. Mataverde® Garapa Decking has very good dimensional stability. 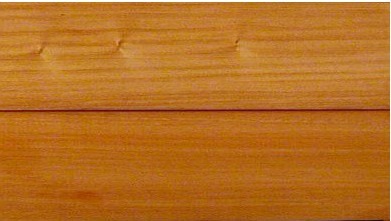 Garapa wood shows only minor movement after it is milled. 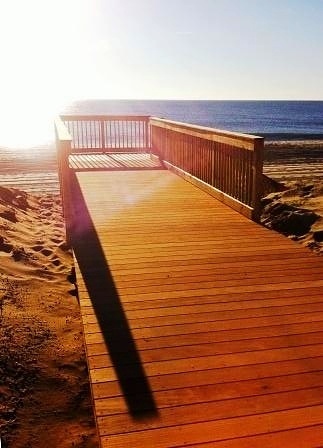 Mataverde® Garapa Decking is kiln dried (KD Garapa) which minimizes any shrinkage and checking. Garapa decking is a great decking material option to provide an all natural real wood deck surface that is just right for you. 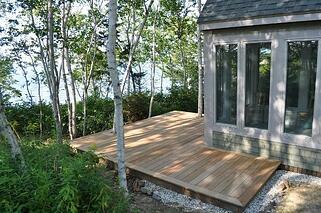 Garapa has a Janka hardness of 1,630 lbs (Garapa decking is up to three times harder than pine, cedar and redwood). The only other wood decking materials that are stronger than Garapa decking are other high density hardwood decking materials such as Ipe and Cumaru. Garapa decking has a bending strength of 12,900 psi.That means that Garapa wood will span greater distances with very little deflection. 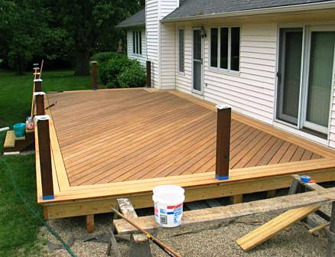 The less deflection in a deck board means your Garapa decking is more solid and will "bounce" less when you walk on it. How Does Ipe Hardwood Decking Compare to Garapa? • Garapa decking can also be installed using Eb-Ty hidden fasteners. No screw heads are visible in the Garapa deck boards when you use pre-grooved Garapa decking and Eb-Ty hidden deck fasteners. Garapa decking is a low maintenance decking material. 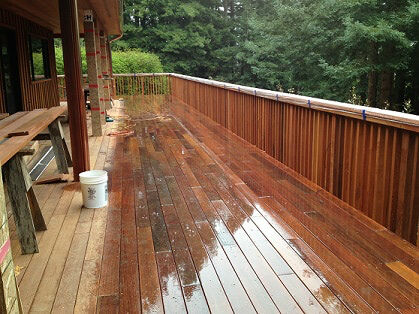 Like any other decking material, Garapa should be cleaned to remove debris and dirt to look its best. Garapa decking can be left alone to weather naturally. 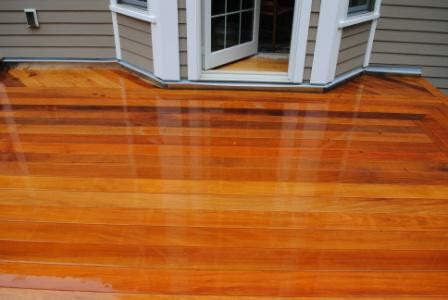 Garapa can also be oiled with a decking sealer such as Penofin for a darker and richer appearance on your deck.